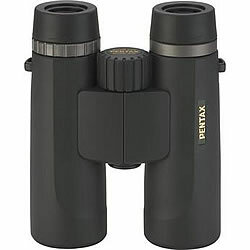 The Pentax 10x36 DCF NV binocular borrows many cues from the flagship DCF ED lineup, with a similar focusing dial and eyecup design, and does so with more approachable pricing. The 10x36 DCF NV gives a combination of phase-corrected roof prisms, fully multicoated optics, and a modern waterproof housing with most of the brightness and viewing comfort of the larger and more costly designs. As the 10x model of the 36mm DCF NV series, it offers a wider viewing field and an easier time of hand holding than its 10x36 sibling-if you're planning on viewing from water it is the only choice.